A PNNL Nuclear Process Science Initiative (NPSI)-developed technique to study particles in liquid using high-vacuum scanning electron microscopy (SEM) serves as the basis for a great journal paper, but NPSI researchers are also showcasing their discovery in a very visual way. When the Journal of Visualized Experiments (JoVE) accepts a paper, authors work with the peer-reviewed publication to create a video to accompany the written product. “I believe it makes it easier for other researchers to duplicate our method if they can see how we do it,” said Xiao-Ying Yu, an engineer in PNNL’s Earth and Biological Sciences Directorate. She coordinated submission of the NPSI paper to JoVE and the subsequent video development. 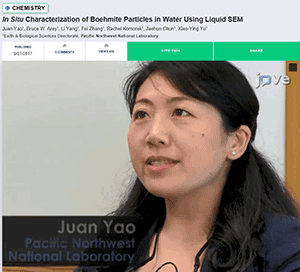 The paper, "In Situ Characterization of Boehmite Particles in Water Using Liquid SEM," outlines a technique developed in the NPSI project led by Jaehun Chun, a Physical and Computational Sciences Directorate engineer. The technique offers several advantages over existing methods and will help answer key questions in the microscopy and microanalysis field, such as how to characterize evolving particle size and morphology corresponding to changes relevant to Hanford Site tank waste conditions like pH and ionic strength. The paper and video were published in fall 2017. In addition to Yu and Chun, other authors, most of whom are featured in the video, are Juan Yao (EBSD), Bruce Arey (EED), Li Yang (former PNNL postdoc), Fei Zhang (former PNNL graduate student), and Rachel Komorek (EBSD). NPSI is a PNNL Laboratory Directed Research and Development initiative stewarded by the Energy and Environment Directorate. To learn more, see the NPSI website.